CONAKRY, Guinea, Oct 4 2018 - Guinea’s fast-growing bauxite mining industry is threatening the livelihoods of thousands of Guineans, Human Rights Watch said in a report released today. Mining has destroyed ancestral farmlands, damaged water sources, and coated homes and trees in dust. The 146-page report, “What Do We Get Out of It? : The Human Rights Impact of Bauxite Mining in Guinea,” focuses on two mining projects that were Guinea’s two largest bauxite producers in 2017: La Société Minière de Boké (SMB), a joint venture linked to the world’s largest aluminum producer, China Hongqiao Group, that has expanded extremely rapidly since it began in 2015; and la Compagnie des Bauxites de Guinée (CBG), a decades-old company co-owned by multinationals Alcoa and Rio Tinto. Guinea’s government, which has transformed Guinea into the world’s third-largest exporter, should take immediate steps to better regulate companies and protect communities. Guinea has an abundance of natural resources, including the world’s largest bauxite reserves, but remains one of the world’s poorest countries. The demand for Guinean bauxite in global markets has increased in recent years as other countries, notably Indonesia and Malaysia, banned exports, in the latter case partly due to the industry’s environmental impact. Guinea is already the biggest exporter of bauxite to China, the world’s largest aluminum producer. And with several new mining projects preparing to begin exports, Guinea’s bauxite boom shows no sign of slowing down. Human Rights Watch interviewed more than 300 people in 30 mining-affected villages in the Boké region, the center of the bauxite boom, and conducted dozens of interviews with government officials, mining companies, civil society groups, environmental scientists, and public health experts. Dozens of farmers described how mining companies take advantage of the government’s failure to protect rural land rights to exploit ancestral farmlands without compensation to address the long-term value of land to the community. Since the passage of a 2011 mining code, the government has failed to pass regulations, required by the code, establishing compensation standards for land acquisition that could better protect farmers’ rights. Although women participate in farming, the bulk of compensation is paid to men in family or community leadership roles. “Our husbands just give us whatever they want, even if the products that came from this land were used by all of us,” said one woman. While at least some men get employment with mining companies to replace lost land, few jobs are open to women. Of the more than 7,600 people employed by SMB in September 2018, only 274 were women. 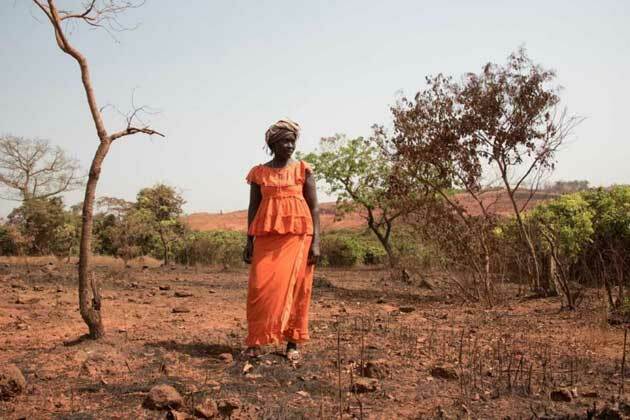 Dozens of residents also said that the dust produced by the mining and transport of bauxite had blighted their lives, with red dust entering villages and homes and covering crops. And villagers, many of whom said they believe mining is already contributing to respiratory illnesses, worry about longer-term health impacts. In meetings with and letters to Human Rights Watch, mining companies pointed to their efforts to stimulate local development and mitigate the negative impacts of mining. SMB, in a September 2018 letter to Human Rights Watch, said that, “the respect of human rights forms the pillar of our values,” and provided a detailed response to the report’s factual findings. CBG also responded in detail to the report’s findings, underscoring that, since receiving a World Bank-linked loan in 2016, the company has done much to improve its environmental and social management. As Guinea’s bauxite boom continues, the government’s capacity to oversee the mining industry and protect community members’ rights needs to keep pace, Human Rights Watch said. While the government wants to attract investment, it should also fine, suspend, or stop mining projects if companies egregiously or persistently flout the environmental, social and human protections enshrined in Guinean and international human rights law.